Scottish emigrants to Pictou County soon discovered rich veins of "black gold", and by 1807, were putting out coal from small pits. These modest operations were driven out of business by the arrival from England on June 4, 1827 of the General Mining Association, a British mining company. They brought with them 200 tons of mining equipment, skilled engineers and experienced colliers. Within three months the GMA were taking coal from the Foord seam at Albion Mines (renamed Stellarton in 1870). To support the mining, they erected the first steam engine in Nova Scotia, built a surface plant, and put up modest workers' cottages. The Storr pits, destroyed by fire, were replaced by the Bye pits. In 1853 the Cage mine was the first to use an elevator-type "cage" for travelling the shaft. The GMA began developing their fifth mine, the landmark Foord in 1866. The Samson and the John Buddle were two "iron horses" imported from England. 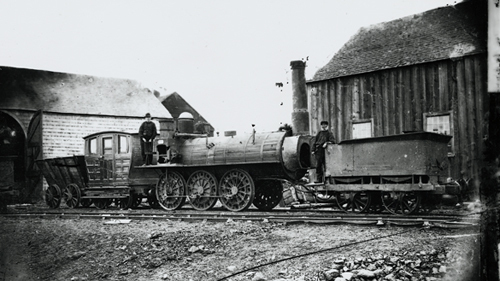 On September 19, 1839, hundreds of Pictonians jammed aboard a train to celebrate these first locomotives to run on iron rails in Canada. Pit horses, groomed to shining, paraded riders in colourful costumes. Later, Mi’kmaqs in traditional dress led a torchlight procession. After feasting on roast oxen and ale, miners and their kin danced to the music of fiddles and bagpipes. The dignitaries, meanwhile, were enjoying a banquet where wine was served round the table by a miniature train. After the GMA monopoly was finally revoked in 1858, competing companies moved into the coalfields. Westville was born as Acadia Mine when the Acadia Coal Company started development in 1866. 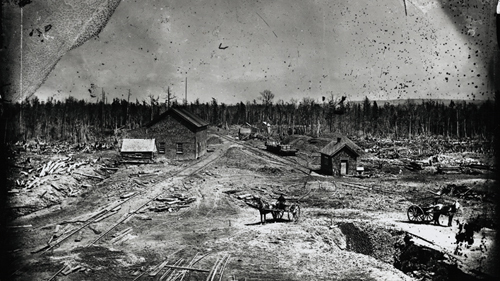 The next year the Intercolonial Company opened their Drummond mine there. The companies built rail spurs to main lines, shipping piers, and housing for the workers who were moving here, hoping to improve their lot in the Pictou County coalfield. By 1913 Pictou County was booming with coal-fuelled industry, particularly steel making and secondary steel manufacturing. As a result the county was enjoying tremendous prosperity. Acadia Coal's Allan mine was sunk in 1904. Dubbed the "million dollar mine", the Allan was a marvel of engineering for its time. The bullwheel marks the location of the Number 1 Shaft. Buildings are, left to right: power house, smokestack, boiler house for generating electricity, hoisting engine house, storeroom, bankhead building, blacksmith shop with pit tub repair shop in back, lamp cabin, machine shop, main office, and first aid room. Not visible are the carpenter shop and the main wash house with rescue station underneath. By 1950, Stellarton coal could not compete against oil. Mining here was still old-fashioned, due to the tendency to spontaneous combustion and roof falls. Experts declared the seams incompatible and unsafe for modernization which might have made these pits cost-effective. In 1951 three separate fires permanently closed the dangerous Allan Shaft. The Albion was worked out in 1955. On May 20, 1955, 100 men were trapped behind a dam of compacted rubble after a flood in the MacGregor. As their precious oxygen dwindled, they were rescued in the nick of time. "It was sure good to see the daylight again. I could see the safety lamps flickering out all around me: there was no oxygen. When they broke down the door several lamps were already out. I walked up with men who said: `You'll never get me down a pit again.' A few days later they were down cleaning up." In 1946 Acadia Coal reopened the McBean Seam in Thorburn, where the geology was suitable for modern mining. DOSCO (the owner) touted the new McBean as the first all-mechanized mine in Canada. However, oil continued to usurp coal markets, so that the mine soon depended on production and transportation subsidies. The McBean closed on June 30, 1972. At Westville, the small Drummond mine, now locally owned, mined coal by hand methods until a bad fire in 1984 closed this historic pit. Some of its 40 or so laid-off employees found work surface mining in Westville with Pioneer Coal.